Yellow mangroves are so called because of their yellow-green leaves. Ceriops tagal var. australis (yellow mangrove) is a member of the Rhizophoraceae family. It is found throughout the Indo-Pacific region and distributed across northern Australia, extending south to the Tweed River on the east coast and to Broome in Western Australia. This species is commonly found on firm, peaty, well drained clays, clayey mud or sand clays at the upper tidal limit of the mangrove shore. Here, infrequent tidal inundation aids in accumulating leaves and twigs, which decompose to form peat. 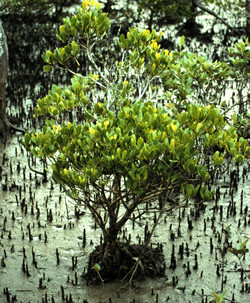 Yellow mangrove also grows in soils that are poorly drained and frequently inundated by the tides, where it forms low, open shrub lands. This species can grow from a shrub of 0.5-1 m to a small slender tree of 2-7 m.
The bark is yellowish or light brown to grey, and is roughened by corky lenticels (air pores) along the trunk. The base of the tree is buttressed (a distinguishing feature) and leaves are yellow-green with dark green in shaded areas. Leaves grow to 7 cm long and 4 cm wide, are oval-shaped with a notched tip and are slightly curled under at the edges. They are arranged opposite one another in groups at the ends of branchlets. Flowers are white and about 6 mm long, and appear in pairs at the base of the leaves. 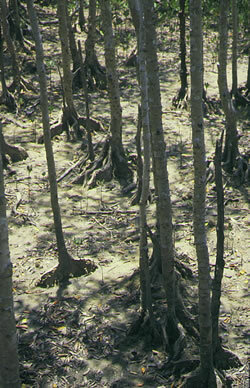 Buttressed trunks are a distinguishing feature of the yellow mangrove. Flowering occurs between September and December. Flowers open in the late afternoon and are pollinated by night-flying insects, such as moths. Brown, pear-shaped fruit that is 10 to 12 mm long appear between December and January. A smooth, tapered, cylindrical propagule of 10 to 15 cm protrudes through the fruit wall and is suspended vertically beneath the fruit. This propagule often takes on a reddish colour as it matures until it is shed into the water with the fruit. This species excludes salts through its roots as water is taken up. The timber is tough and dark brown. It can be used as a tanning agent, as dye and in medicines. It has substantial value as fisheries and wildlife habitats.